Hand-woven Assomption sash or ceinture flêchée of fine worsted wool with a long fringe. Design is in a traditional arrow or lightning bolt motif. One of the major sites for the production of the hand-woven sashes was in L’Assomption, Quebec. A popular trade item, machine-manufactured versions using coarser woollen yarns were produced in England and called Manchester sashes. Learn more - enter 'Lagimodière,' 'Gaboury' or 'clothing' in the search box to your left. See an artist's impression of Lagimodière and his wife Marie-Anne. Check the Beaver Index - e.g., Pritchard and Lagimodiere, by Clifford P. Wilson, June 1948. Visit the Manitoba Metis Federation to learn more about the Order of the Sash. The original ownership of this sash is attributed to Jean-Baptiste Lagimodière. He travelled west about 1800 from Trois Rivières, Quebec, later bringing out his new wife, Marie-Anne Gaboury. Lagimodière worked as a trapper and trader in the Red River Colony and in the Fort Edmonton area. At one point, he travelled 3000 km in five months with despatches from Red River to the Hudson’s Bay Company headquarters in Montreal. En route back to the Colony, he was captured by the North West Company and imprisoned for 56 days at Fort William. After his release, he was given a land grant across from Upper Fort Garry. 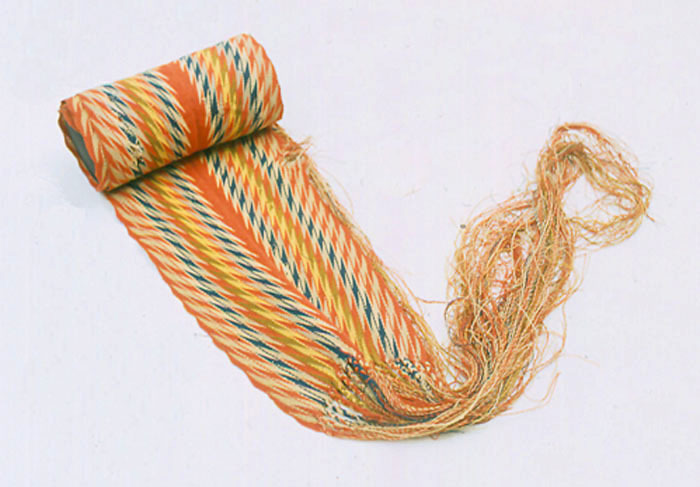 The Assomption sash was highly valued by Métis voyageurs and traders for its attractive appearance and for its practicality. It was not only used as a belt, but also served as an emergency harness, rope, tumpline or even a horse bridle.